Winter Night Nails with Plastic Wrap Method - Be Glossy In and Out! You can also apply the polish directly to the plastic wrap and then dab it over the nail if it`s easier for you. I hope you like it and if you will try it, please show me your model:) You can make any color combination. 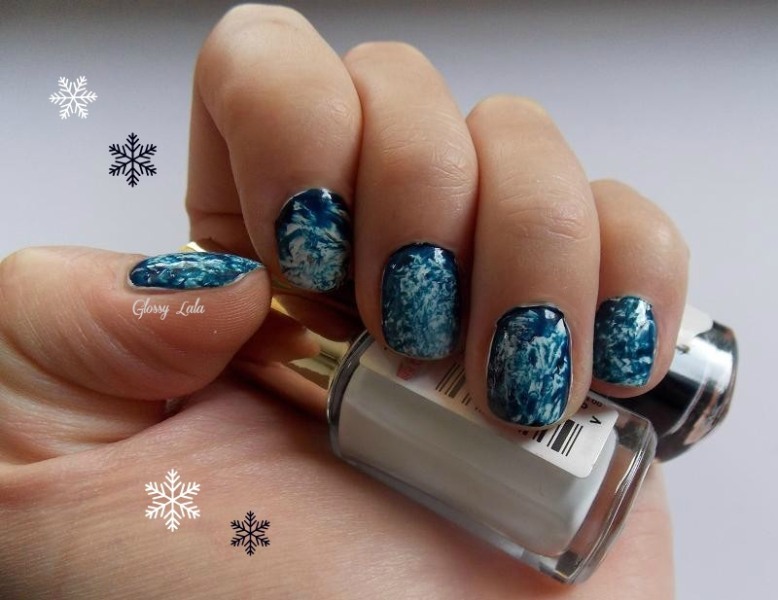 Beautiful nail design with a subtle winter snowflake vibe! Υπέροχο σχέδιο κ' για χειμώνα αλλά κ' για καλοκαίρι!!! Wow!!! These nails are amazing!!! So pretty! Definitely reminds me of snowflakes! wow, I've never seen anything like this before! Really creative method! I can't totally understand how you did that, but it looks amazing! Great Nice! I like it so much! Da mai incearca!! Sigur o sa-ti ia frumos. Yes, that was the idea:)) Glad you like them!! Really cute. I love how creative you are. This is so Beautiful... You are really very creative. great post! i have tried water marble nailpolish and its really tricky (and messy!) this looks like a great alternative!! Wow Your nails look AMAZING!! That is a really clever idea, I will definitely try it out!